From soft pastels to bright color flashes, the most important accessory for a unique look is a striking hair color. Models and It Girls, such as Kylie Jenner and Nicole Richie have set the trend for electrifying highlights, and daring placements in every color of the rainbow. With the understanding that colors like this are not worn by consumers as an accessory; Schwarzkopf Professional now enables clients to experience striking hair color, without a long-term commitment. In May 2016, Schwarzkopf Professional will be expanding their IGORA product line with the launch of the highly anticipated IGORA ColorWorx. The range includes eight different shades; from vibrant red, to fresh green and dazzling violet. The new shades last for up to twenty washes, and can be combined with any oxidative, or nonoxidative Schwarzkopf Professional hair dye. Due to the 2x higher pigment concentration, the shades offer intense color results that are made to stand out. 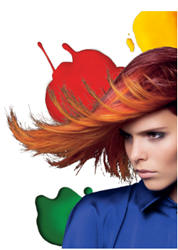 Whether you are going for a subtle look or a vibrant color, IGORA ColorWorx has it all. Goodbye boredom, hello spontaneity! While other brands have also taken the opportunity to capitalize on the bold color hair trend, and turn it into a yearlong social media obsession, IGORA ColorWorx from Schwarzkopf Professional offers unique points of differentiation designed for customer longevity, which include; direct application, pastel mixing, customized, boosting, and correction. The majority of competing brands do not offer the option for their direct dyes to able to be mixed with oxidative dyes, nor do they provide the option to intensify, correct, dilute or customize color, all of which can be done with IGORA ColorWorx. IGORA ColorWorx gives stylists the opportunity to unleash their creativity; whether it be to intensify a look, create a new look, or to color correct and soften existing tones. ColorWorx allows stylists to create every conceivable look or color combination. The new shades are intermixable with color from any brand, but provide highly optimized results when used with Schwarzkopf Professional color. The eight colors are available in; Red, Orange, Yellow, Green, Blue, Violet, Pink, including a diluter in White for mixing. IGORA ColorWorx will be available in Schwarzkopf Professional partner salons beginning May 2016. Schwarzkopf Professional, part of the Beauty Care business unit of Henkel Consumer Goods, has been a leader in the salon industry for the past 118 years. Established as a global leading supplier in the hairdressing business; Schwarzkopf Professional offers brands and technologies that make people’s lives easier, better and more beautiful. Based on a professional partnership with the hairdresser, Schwarzkopf Professional focuses on providing innovative concepts and services, which match the needs of their International salon clientele. Schwarzkopf Professional is present in over 80 countries. Well known International brands include; BLONDME (blonde color, care and styling), and OSiS+ (styling). Schwarzkopf Professional’s mission statement, “Together. A Passion For Hair” is their point of difference, and is the unique pulse which unites their business with their salons and consumers. Their daily goal is to bring that passion for hair to life. Henkel Consumer Goods operates worldwide, with leading brands and technologies in three business areas; Laundry & Home Care, Beauty Care and Adhesive Technologies. Founded in 1876, the company has some 47,000 employees and holds leading global market positions in Schwarzkopf, and Loctite. For additional information, please visit our website at Schwarzkopf-ProfessionalUSA.com. For up to the minute news on all things Schwarzkopf Professional, follow @SchwarzkopfUSA on Instagram and Twitter, and also connect with us on Facebook at: Facebook.com/SchwarzkopfProfessionalUSA.